Game of Thrones is the BEST HBO TV series. It’s the depiction of powerful families, Kings and Queens, knights and renegades, liars and honest men, all playing a deadly game for control of the Seven Kingdoms of Westeros, and to sit atop the Iron Throne. The series bases it’s location on a fictional world of Westeros and Essos and has many different plots but several noble houses fight to sit on the Iron Throne and be King of the Seven Kingdoms. There are different couples that can be matched here in the Game of Thrones, you can mix and match the costume below for the best effect. Here are the best Game of Thrones couple costumes whether they be with an adult and a kid, or 2 adults, or 2 kids, here are the best costumes for 2 people. Click here for more GOT costume ideas. Arya is the daughter of Eddard Stark and Catelyn Stark. She weilds a sword given to her by her half brother Jon Snow. She named her sword, because every sword needs a name, needle. Her first interaction with The Hound is when The Hound murders her friend Mycah. She vows to kill him. 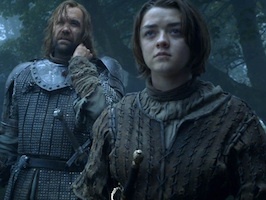 Later in the show, The Hound captures Arya and wants to sell to her Aunt Lysa Arryn in the Eyrie. This is a great costume idea for an adult and a kid. Click here for costume idea for The Hound and here for Ayra. 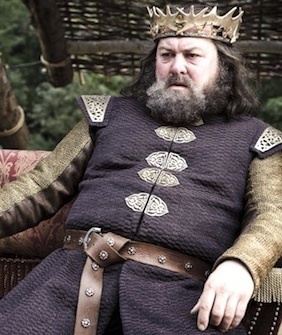 Robert Baratheon and Cersei Lannister were married after Robert’s Rebellion. They were the King and Queen of the Seven Kingdoms. 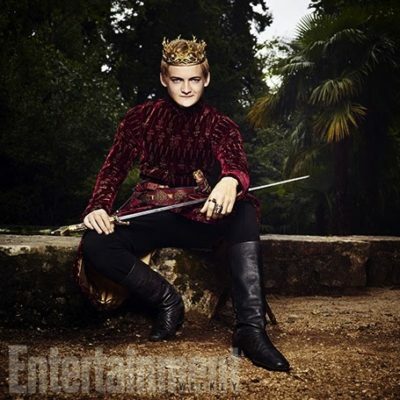 They have three kids who are Joffrey, Myrcella and Tommen of House Baratheon of Kings Landing. Cersei plans the death of her husband and he dies in a boar hunting accident. This is a great idea for Game of Thrones Couple Costumes. 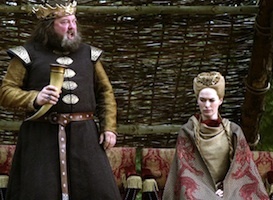 Click for costume idea for King Robert Baratheon and here for Cersei Lannister. Jamie and Cersei Lannister are twins of Tywin and Joanna Lannister. Tywin and Joanna also have a third son named Tyrion. Jamie and Cersei have an incestuous relationship which Bran Stark finds out the hard way when he sees them and is pushed from the window by Jamie. Jamie and Cersei are the real parents of Joffrey, Myrcella and Tommen but Robert somehow doesn’t know or never acknowledges it. They are passed off as the King’s children. Throughout Game of Thrones, Jamie and Cersei are together and have a very crazy relationship. This is definitely a great costume idea for a couple. 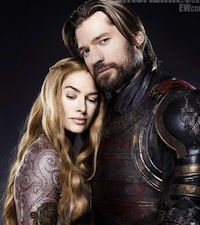 Click here for costume idea for Jamie Lannister, and here for Cersei Lannister. Petyr Baelish also known as Littlefinger served as Master of Coin to King Robert Baratheon. They have a complicated relationship as Petyr Bealish loves Sansa’s mother Catelyn. Later in the Game of Thrones, Sansa is married to Tyrion Lannister. When Tyrion is accused of murdering King Joffrey Baratheon, Petyr Baelish takes her to his holdings on The Fingers disguised as his illegitimate daughter. This is a great costume for two people. 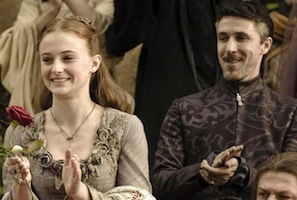 Click here for costume idea for Petyr Baelish and here for Sansa Stark. Daenerys Targaryen’s brother Viserys longs to sit on the Iron Throne. 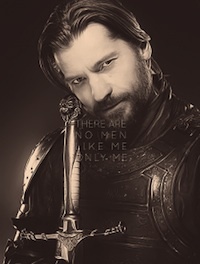 He barters a deal with the Dothraki Warlord to get 10,000 men and in return for marriage with his sister – Daenerys. Daenerys doesn’t want to marry Khal Drogo, but Viserys says that she will and will make her sleep with all of Drogo’s 40,000 men and their horses if that’s what it takes to get the armies. Daenerys eventually grows to love and please Khal Drogo. This is a great costume idea for a couple. Click here for costume ideas for Khal Drogo and here for Daenerys Targaryen. When Khal Drogo and Daenerys Targaryen marry, she received three dragon eggs from Illyrio. When her husband died, she burned Khal Drogo’s body on a pyre. She brought in her three dragon eggs into the burning pyre. The next morning she emerged alive with her three dragons hatched. She has hence forth been named as Mother of Dragons. She has named her dragons Drogon, Rhaegal, and Viserion. Click here for costume ideas for Daenerys Targaryen and click here for costume ideas for dragons. Ygritte was Jon Snow’s lover. She was a fierce, courageous and quick witted woman who was of the Free Folk who lived North of the wall in Game of Thrones. She was captured by Jon Snow, escapes but is captured again by Snow. Lots of things happen between the two but they love each other in the end. In the end, Jon Snow watches Ygritte killed by Olly. Jon Snow builds a funeral pyre for Ygritte before a weirwood tree. Since they are getting married in real life. This is a great idea for Game of Thrones Couple Costumes. Click here for Jon Snow. When Eddard Stark came upon six direwolf pups and their deseased mother, Robb Stark decided to allow each Stark kid to adopt a direwolf. Jon Snow took the white albino wolf with red eyes and named him Ghost. Ghost was the runt of the litter but grew as large as his siblings. Ghost follows his master Jon Snow and the rest of the Night’s Watch as they venture deep into wildling territory in their Great Ranging. 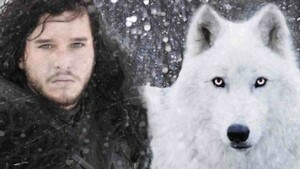 Find Ghost Direwolf costume and Jon Snow‘s pro costume.